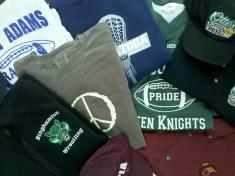 Embroidered or Screen Printed Apparel ..... that BRANDS your Business!!! Pocket/tye dye Pocket medium/heavy wgt. medium/heavy wgt. So why not schedule an appointment with one of our Sales Professionals, in your office, and at your convienience?